Some lawmakers blame Tesla itself; company points to new-car dealers as the problem. Francisco Kjolseth | Tribune file photo Rep. Kim Coleman, R-West Jordan, left, tours a Tesla Model S in front of the Utah Capitol last March, the day after the House defeated her legislation HB394 to remove the current prohibition on manufacturers owning a dealership in the state. Currently they have to go through third-party franchises. 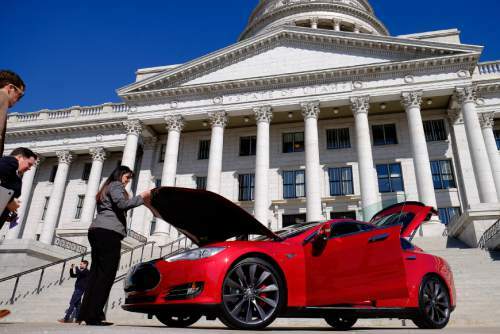 A bill that started out aimed at helping Tesla Motors overcome legal roadblocks to selling cars in Utah sputtered and ran out of gas Thursday after talks broke down and Tesla ended up opposing the legislation. Rep. Kim Coleman, R-West Jordan, abandoned efforts to pass legislation this session that would have allowed Tesla and other similar manufacturers to sell cars online directly to consumers after Tesla balked at a provision that would have required the carmaker to ship vehicles to customers, rather than keeping inventory anywhere in the state. Coleman said she plans to spend the next several months continuing talks about how to change Utah&apos;s Depression-era franchise law, which currently requires car manufacturers to sell their vehicles through franchised dealerships, rather than directly to customers. "I believe this is the best bill we&apos;ll ever get," she said of HB384, before pulling the plug on it. "Because we still do have problems in defining the scope and meaning of &apos;sell,&apos; it&apos;s a significant hangup, and I&apos;d like to study this  and really study this  in the interim." Rep. Brad Wilson, R-Kaysville, expressed frustration that Tesla ended up opposed to the bill after more than a year of negotiations. "I&apos;m a little frustrated that it has been characterized that Representative Coleman and the Legislature are trying to do something to harm Tesla when, in fact, when we started this journey over 15 months ago, it was just the opposite," he said. Tesla&apos;s corporate counsel, Todd Maron, said it&apos;s not the carmaker that is to blame for the failure to reach an agreement. "I think the fundamental problem is, as Representative Coleman explained, people at the negotiating table wanted for us to not be able to sell cars in the state of Utah. They wanted to dictate the terms their competitors would be able to sell cars," he said. "In that dynamic it&apos;s very difficult to reach an agreement. At points we were very close to an agreement, but when pen got put to paper … there wasn&apos;t a deal to be had that was good for consumers in the state of Utah." Tesla has a lawsuit pending before the Utah Supreme Court challenging the Utah dealer law.